Incidence of kidney disease has increased significantly in the recent years. It has been estimated that every year, 100,000 people develop severe kidney failure requiring dialysis or transplantation, in our country. If patients with mild to moderate kidney disease is also included, number will be far higher. Treatment of kidney failure is expensive and it is beyond the reach of majority of patients affected by this problem. Kidney disease could also cause malfunction of other organs. High blood pressure, anemia, weak bones, poor nutritional health and nerve damage are some of the problems that can occur as a result of kidney disease. 1.Incidence of diabetes and high blood pressure has increased in recent years. Adult onset diabetes begins at a younger age now as a result of changes in lifestyle. Consumption of rich food especially those with high salt content and work associated stress have increased the incidence of hypertension also. Risk of developing kidney disease increases with the duration of diabetes. Uncontrolled blood pressure also could lead to kidney disease. If a person has both diabetes and hypertension he is at a much higher risk of developing kidney disease as compared to having either disease alone. Furthermore, hypertension in a person with diabetes and kidney disease causes faster progression of the disease. 2. Kidney disease does not get sufficient attention early as all the efforts are concentrated on heart disease. By the time kidney disease is identified it is often too late. 3. Increased consumption of painkiller medications is also one of the causes for kidney failure. Several pain killer medications (Brufen, Voveran etc.) are available without prescription. Regular use of these medicines can cause kidney damage even in healthy individuals. However, in elderly and those with mild kidney disease even few tablets of pain killer medicines can precipitate severe renal failure. 1. Once there is severe kidney failure (Called end stage renal failure) treatment options are limited. It includes kidney transplantation or lifelong dialysis. There are two different types of dialysis; haemodialysis and peritoneal dialysis. All these options are expensive. 2. Mid to moderate kidney failure may cause lot of other complications. It causes anemia, which results in fatigue, giddiness. The affected person will have less energy and trouble in concentrating. Appetite my come down and the person may have trouble in sleeping. Kidney may not be able to concentrate urine and the person may have the urge to pass urine especially in the night (this may be the earliest symptom of kidney disease). Albumin level in the blood may drop as a result of leakage of albumin in the urine and this may cause swelling around the eyes in the morning and swollen feet and legs in the evenings. Bones may become weak and this may lead to bone pains and easily breakable bones. 3. Kidney disease itself may cause high blood pressure. In those people, who already have high blood pressure, kidney disease may make it worse. Kidney disease increases the blood levels of different kinds of fats in the blood. Through these mechanisms, kidney disease increases the risk of developing heart disease and stroke. 4. Several drugs are removed from the body by the kidney. Presence of kidney disease will lead to accumulation of drugs in the body and results in drug toxicity. Anyone can develop kidney disease at any age. However, some people are more likely than others to develop kidney disease. The following groups of people are at increased risk. People at increased risk of developing kidney disease should get a complete physical examination done and get the blood pressure checked at frequent intervals. The following preliminary investigations will pick up an early kidney disease. a. Protein: Presence of protein in the urine suggests damage to the filtering units of the kidney. The normal rate of albumin excretion is less than 20 mg/day (15 µg/min); persistent values between 30 and 300 mg/day (20 to 200 µg/min) is called microalbuminuria. This is the earliest demonstrable abnormality of the kidneys. Values above 300 mg/day (200 µg/min) are considered to represent overt proteinuria. A 24-hour urine collection is the gold standard for the detection of microalbuminuria. 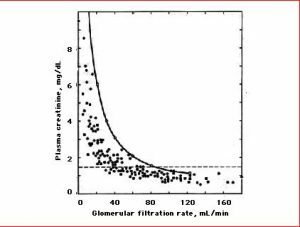 However, an easier and accurate way of estimating microalbuminuria is by calculation of the albumin-to-creatinine ratio in a random urine specimen. A value above 30 mg/g (or 0.03 mg/mg) suggests that albumin excretion is above 30 mg/day and therefore that microalbuminuria is probably present. b. Red Cells, pus cells: Red cells in the urine suggest inflammation of the kidney, stone or infection. Pus cells suggest infection. Urine should also be checked for cells crystals, pus, and bacteria. 2. Creatinine level in the blood: This is a simple test, which gives lot of information about kidney function. When the kidney is damaged, creatinine level in the blood starts rising. If these preliminary tests are normal they should be repeated every year. If the blood or urine tests show any abnormality detailed evaluation is required. Attempt should be made to identify the cause of kidney disease. 1. Glomerular filtration rate (GFR), which tells how much kidney function is present, can be calculated from the creatinine level, age, body weight and gender. Upper limit of creatinine is 1. 3mg/ dl. A value of 1.4 mg/dl or higher suggest significantly reduced function of the kidney. However, creatinine level is dependant on various factors such as age, gender, body weight and muscular mass. In children, women and those with reduced body weight creatinine values are lower. Hence, a value of 1.3 mg/ dl in an elderly emaciated lady suggest significant reduction of kidney function while similar figure in a healthy muscular young male indicates normal kidney function.Complete blood counts should be checked. The other parameters, which should be measured, include blood levels of protein and albumin, sodium, potassium, bicarbonate, calcium, phosphate and uric acid. 2. An ultrasound scan of the kidney gives lot of information about the kidney and urinary tract. It tells whether the kidneys are too small or too large and whether any structural damage has happened to the kidneys. It also gives information regarding stones, tumours and whether there is any obstruction to the passage of urine. Early detection and treatment can often slow or stop the progression of kidney disease. Frequent follow up will be required to determine the progression of the disease. 1. In patients with kidney disease, control of blood pressure is very important. Target blood pressure should be lower in patients with kidney disease as compared to those who have do not have kidney disease. The current recommendation is to keep blood pressure, in this group of patients as low as possible. Systolicpressure of less than 120 mm Hg and a diastolic pressure ofless than 80 mm Hg are desirable targets. Drugs like angiotensin converting enzyme inhibitors (ramipril, enalapril) and angiotensin receptor antagonists (losartan, irbasrtan) are effective in the treatment of kidney disease. Studies have shown that they are helpful in preventing the development of kidney disease. These drugs are also effective during the early phases of the disease such as microalbuminuria, significant proteinuria and mild kidney failure. However, caution has to be exercised while using these drugs as they can occasionally precipitate a sudden decline in kidney function in some patients. 2. Strict control of blood sugars will prevent or slow down the progression of renal disease in those with diabetes. Both fasting and after food sugar levels should be kept at as close to normal levels as possible. 3. On of the major complications of kidney disease is wasting and weakness of bones. When the kidneys are not working normally phosphorus level in the blood accumulate. This leads to loss of calcium from the bones resulting in weakening of bones. A phosphate binder (usually a calcium salt) will reduce this complication. Patient should also be given vitamin D.
4. Anemia should be corrected. A hormone called erythropoetin is useful in treating anemia due to kidney failure. However, erythropoetin is expensive. 5. Avoid or reduce the use of pain killer medications (Nonsteroidal anti-inflammatory drugs). 6. Smoking should be stopped and alcohol intake should be avoided. An exercise programme is recommended. 7. Patients with kidney disease should be on a special diet. Protein, salt and fat content of the diet should be restricted. Fluid intake should be restricted if there is swelling of the body. It is also important to restrict food items like fruits and chocolates, which are rich in potassium.